On February 23rd 1854 the 28th (North Gloucestershire) Regiment set sail from Liverpool on the troopship “Niagara”, bound for Gallipoli to support Turkey in her resistance to Russian designs upon Constantinople and the Mediterranean. On March 28th War was declared upon Russia, and the allied expeditionary forces were not to become engaged with their Russian opponents until the invasion of the Crimea in September. “A line in adieu before leaving old England to fight the Roosians. I send you a piece of Music which I hope you will approve of and play it in remembrance of our past acquaintance. We leave Liverpool on Wednesday by Niagara steamer. All who are going are in the highest spirits and you cannot think how miserable the poor fellows look who are to be left behind at the Depot. The Depot is to be at the Isle of Wight, and I can recommend to your notice, should you happen to meet him out, Lieutenant Turner, a capital dancer, and generally liked as a partner for a waltz. I went to say “goodbye” to them at Hampstead last Tuesday. The place looked sad, at least it did to me – I only hope I may live to see it again. If any confounded Russian does hit me, God grant it may not be in the back – I shall have to carry the Colours and of course shall be the first to be picked off. Never mind, we shall live to meet again. “Remember me in farewell to “Toby Brown” and Meux who ought to join us as a volunteer. “With best love, Your affectionate Cousin, (signed) James Williams. The battle of the Alma was fought on 20th September 1854, and the 28th were present but not engaged. They were in reserve with Third Division, and when the opportunity for pursuit of the defeated Russians was missed, Third Division was not committed. The battle of the Alma was the last occasion in which the Colours of the 28th were carried in battle and as an ensign of the 28th, James Williams was one of the two last men to have that honour. On 13th October siege operations were begun against the Russian naval base of Sebastopol, and the 28th took up their positions in the trenches. The Russians undertook two offensive operations to relieve the besieged city but in both resultant battles, Balaklava and Inkerman, the Allies prevailed. Except for a hundred men led by Lieutenant-Colonel Adams at Inkerman, the 28th took no part in either battle, remaining in the lines before Sebastopol. By the 3rd January 1855 the Allied trenches were so close to the Russian positions that sharpshooters were no longer required. Maunsell was sent to the hospital at Scutari, and nursed back to health under the supervision of Florence Nightingale. He later rose to the rank of Major-General. Picture: The Presentation of new Colours to the 28th Regiment at Portsmouth, 1850. The last Colours to be carried into battle by the Regiment. 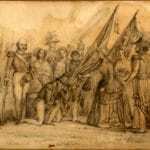 Original in the Soldiers of Gloucesterhire Museum collection.